Kenshin, in what is the last of the series. How will our hero fight an enemy from the past. It begins as it ends...Enishi returns into Kenshin's life by kidnapping Koarou. This first episode in the last Kenshin OAV leaves one wanting the next tape. The Rurouni Kenshin OAV has become one of the modern classics of anime. There is no denying that both the OAV and the television series have become defining parts of the late 90s anime scene, especially in America. With this in mind, Sony started in on a new OAV series, to end Kenshin's television run and tie it better to the manga. Visually, the original Kenshin OAV and the television series sported two markedly different styles; the television series a more pop anime style (similar to the manga it was based on) while the OAV was far moodier, with more realistic characters and more gore. To many, the OAV was far more artistic than the mass market television series. The Rurouni Kenshin movie (released in the States by Manga Corp. as Samurai X: The Movie), mixed the two styles with, at best, poor results. The new OAV series, Seisou Hen (Passing of Time Saga), again dabbles in both, but with far more flair than the movie. The character design is very much in the vein of the Trust/Betrayal OAV series. Kenshin and company look realistic, even Japanese. However, in dealing with the characters and locations from the television series, Seisou Hen has an infusion of color lacking throughout most of the first OAV. There are still the pale blues and the dark colors that are such a memorable part of the original OAV, but they're counterbalanced by bright greens, pinks, and sky blues. Seisou Hen also improves on the formula, as well; 'live' scenes (like the pond, the sky, the sword fight in the Trust and Betrayal) are better integrated into this second series. 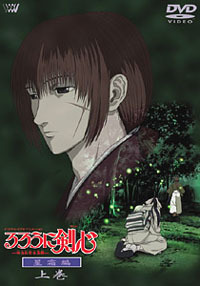 Seisou Hen takes place well after the OAV (which details Kenshin's early life in Kyoto), the television series (Kenshin long after the events in the OAV), and the movie (which takes place after the television series). The latest installment opens up with Kenshin on the deck of a ship, the sea and wind throwing the boat around until he falls off. Our hero falls into the briny deep... and we cut to Koarou, worrying over Kenshin and Kenji, who has gone off to train with Seijiro. We glimpse at tension between Kenji and his new sen'sei; the former wanting to go protect his mom, while the latter (in shades of Star Wars) realizes how dangerous Kenji could be without completing his training. Back in Tokyo, Koarou passes out. Yahiko finds and nurses her, as she flashes back to her life with Kenshin. And thus we come to the crux of this first episode of the OAV. For the most part, it's flashbacks of Kenshin's major battles during the TV series, reanimated into the series. For anyone who's seen the series, it's familiar ground. The OAV covers Kenshin's fights with Ji-neh, Shishio and Soujiro, as well as briefly passing Saitoh Hajime. Koarou also remembers her talks with Megumi about Kenshin and Kenshin's explanation of his past life to her. If all of this sounds familiar, it should be; it was all covered in the television series. However, this episode of the OAV ends with the return of Enishi. After Kenshin explains his past in Kyoto to Kaorou, he finds a slip of paper with "revenge" written on it. Kenshin knows that this is a sign from Enishi, who has it out for Kenshin because of the incidents that took place during the first OAV. Despite the high production quality, the new OAV suffers from the fact that seventy-five percent of it is lifted directly from the television series. Anyone who would watch Seisou Hen would most likely already know the events that take place in it. Having said that, this episode is only one half of the final OAV. Though it serves mostly as a recap episode, sets the stage for Kenshin's final battle, with Enishi. Though the first episode was a little disappointing, it ends promising a very exciting second episode (which is due out in the third week of February). By itself, however, the episode is something like candy...absolutely sweet, but not very filling.